Steve Wheeler is a Learning Innovations Consultant and former Associate Professor of Learning Technologies at the Plymouth Institute of Education where he chaired the Learning Futures group and led the Computing and science education teams. He continues to research into technology supported learning and distance education, with particular emphasis on the pedagogy underlying the use of social media and Web 2.0 technologies, and also has research interests in mobile learning and cybercultures. He has given keynotes to audiences in more than 35 countries and is author of more than 150 scholarly articles, with over 6000 academic citations. An active and prolific edublogger, his blog Learning with ‘e’s is a regular online commentary on the social and cultural impact of disruptive technologies, and the application of digital media in education, learning and development. In the last few years it has attracted in excess of seven million unique visitors. I left school with nothing. No qualifications. Most of the teachers in the schools I attended (I was a forces kid and went to 9 during my school years) didn't seem to care, and failed to motivate me to study. I simply wasn't interested. Later, I was working in a low paid job when I realised, sometime in my early thirties, that I wanted to do something more with my life. I was fascinated by psychology, so I applied, and was accepted as a mature student on an undergraduate degree programme at Plymouth University. It was my dream to become a psychologist, and perhaps also to teach at the university in later years. I told some of my colleagues about this dream, but they didn't take me seriously, and one or two actually laughed out loud. It turned out that because we were in a time of economic instability, and the interest rates soared, that our mortgage was suddenly very expensive to maintain. It transpired that we could not afford for me to leave my job and study full-time as a student, so I reluctantly withdrew from my place at Plymouth University. And then I heard about the British Open University. I saw that they were offering a pathway to a BSc (Hons) degree in psychology and I inquired further. I was told it would take me up to six years to complete a full degree. I told them I would do it in half that time. My advisors told me it couldn't be done. My colleagues in work, even the two I knew who had completed OU degrees, told me it was impossible. My boss asked me why I wanted to do a degree - after all, as far as she was concerned, I was 'just a technician'. This was a red rag to a bull. I was now even more determined to prove them all wrong. And so I enrolled on my first module with the Open University. I completed it successfully and began planning for two more modules. I paid for the entire degree myself, and worked hard in the evenings and at weekends, avidly consuming the materials as they came through, and submitting my TMAs (Tutor Marked Assignments) every month, as deadlines loomed. 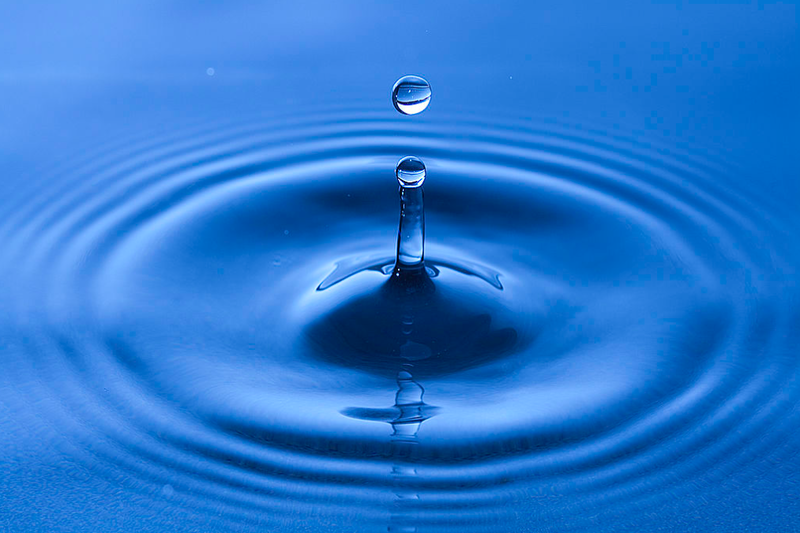 I began to receive back feedback and improved my writing style. On it went, attending summer schools, and evening tutorials with my local groups, learning more about human behaviour, perception and cognitive science. I applied, and received advanced standing for my teaching qualification (Cert Ed) to the value of one full module. Now all that was left was to complete two final modules to gain the credits I needed to be awarded my degree. During this time I took on another job, teaching three evenings each week at the local further education college. I also worked every other Saturday afternoon at Plymouth Argyle FC as a steward. Looking back, I now realise just how crazy I must have seemed, working and studying all hours, sometimes right through the night to achieve my dream. But achieve it I did, in my final year pushing my average TMA grades up into the 80s. One of my final assignments was graded 97%, and it was then inevitable that I would complete my studies with a first class honours degree. It was a very proud day when I finally walked onto that stage at Exeter University to receive my degree from the Open University. I will always be grateful to my family, and to all of the academic staff who supported me as I studied largely at a distance, working through materials and submitting my assignments by mail. 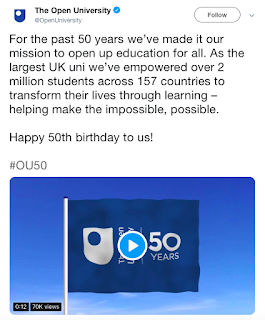 I learnt more than just psychology - the OU taught me about my limits and my motivation to succeed, and how to push beyond them, how to manage my time and commitments, and how to create my own pathways in life. It taught me greater self confidence, built my resilience and developed within me a love of learning that will last a lifetime. 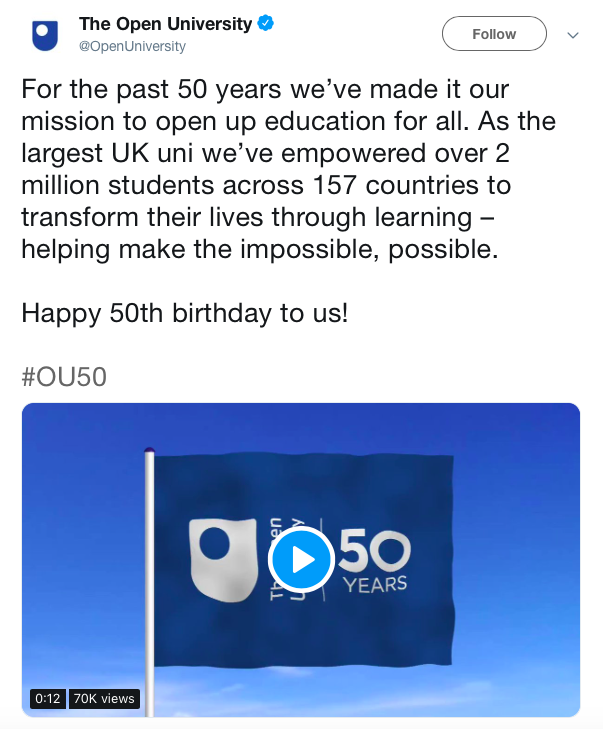 Happy birthday, Open University. Here's to the next 50 years! Second chance #OU50 Steve Wheeler was written in Plymouth, England and is licensed under a Creative Commons Attribution-NonCommercial-ShareAlike 3.0 Unported License. Wheeler, S. (2019) Digital Learning in Organisations, London: Kogan Page. Through us and between us by Steve Wheeler was written in Plymouth, England and is licensed under a Creative Commons Attribution-NonCommercial-ShareAlike 3.0 Unported License.